Murano glass work is the most famous art of Venice and real Murano glass is absolutely the greatest treasure you can bring home from your trip. However, shopping for authentic Murano glass is a challenge because, especially in central Venice, more than half of the glass items represented as Murano glass are fake. To make sure that you really get the best of Murano glass: Look for original contemporary styles, look for the Murano glass trademark and ask shopkeepers about the origin of their pieces. The shops listed below sell real Murano glass in a wide variety of styles and prices. To learn more about shopping for Murano glass in Venice, read our quick guide here. Balbi Art Glass di Agnese Costa & C sas, #1 Fondamenta Venier, Murano. Among the youngest Murano glass masters, Igor Balbi has re-imagined, and breathed new life into the art of sculpting the famous Venetian glass goblets, known as tipetti, that have been coveted by royalty throughout Europe since the late 1600's. The smallest of his contemporary pieces stands at about 12 inches tall and each is as graceful and perfectly balanced as it is full of living color and fluid details. After several years of working, and showcasing, contemporary Murano glass in central Venice, Igor and Agnese have taken their gallery, talent and gorgeous works back home to Murano where you can now find them in their new gallery just across the canal form the Palazzo da Mula. In the small shop of Franco and Mauro Panizzi a quiet revolution is happening in Murano glass arts. Franco and Mauro are two of the island's most respected glass masters when it comes to carving, texturing and fusing Murano glass - masters as cold-working whose skills are called upon by virtually every famous furnace on Murano and top tier design houses the world over - but you haven't seen anything until you've seen their original collection! Here, you'll discover an eclectic selection of original designs that ranges from elegantly fused murrine glass platters to finely carved glasses and vases all the way to magic carpets made of Murano glass. This shop is an essential stop on Murano both for serious collectors and those serious about bringing home the most authentic of Murano glass souvenirs. Few experiences in witnessing and appreciating master craftsmanship come close to that of visiting the workshop of AAV Barbini on Murano, where two current generations of the Barbini family - who have been Murano glass masters since their family name was entered in the golden book of glass masters almost 500 years ago - carry on with what is not only a family tradition, but also very much a gift for elegant craftsmanship. 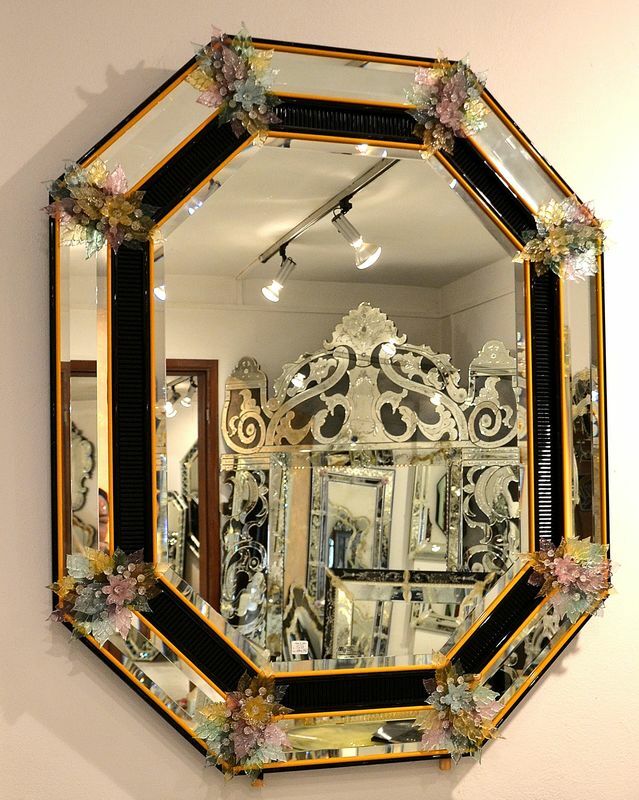 Here you will discover the most breathtaking collection of Murano glass mirrors in Venice and have the pleasure of meeting their humble and pleasant creators. Visitors to Venice who are shopping for Murano glass mirrors, should make absolutely certain to visit here. Not only will you find their stunning current collection, you will also have the opportunity to browse through their books of almost 500 years worth of designs carefully kept within the family. 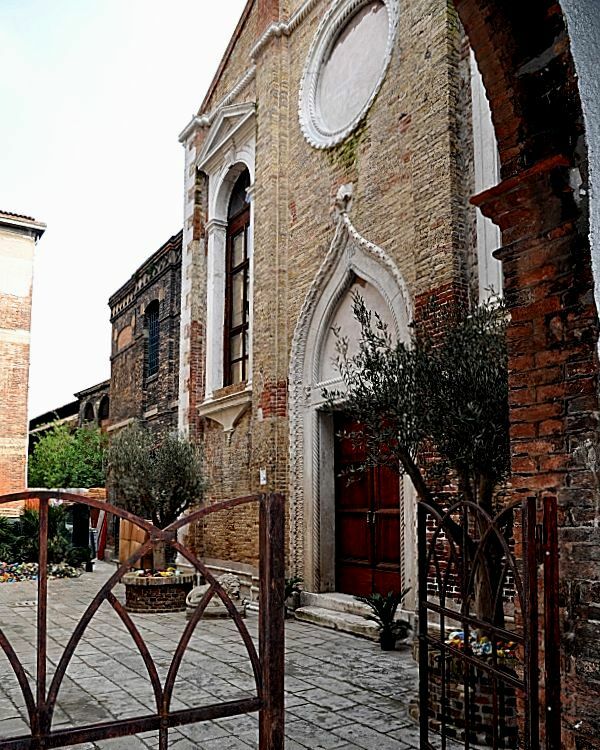 Ex Chiesa Santa Chiara Murano, Fondamenta Daniele Manin 1, Murano, Venezia. The Ex Chiesa Santa Chiara is a newly restored medieval church owned and operated by a local Venetian family who have tasked themselves with the lofty goal of providing visitors with a complete experience of Murano glass at no charge and providing shoppers with a selection of authentic Murano glass that includes everything from signed antiquities to jewelry to quirky contemporary Murano glass sculptures. Ex Chiesa Santa Chiara offers: A historical exhibit of Murano glass working tools and equipment, live demonstrations by contemporary glass masters, the opportunity to formulate your own perfumes - also a historical Venetian art -and bring them home in custom engraved bottles, and an amazingly diverse selection of real Murano glass to shop from. Read more about the Ex Chiesa Santa Chiara and get directions HERE. Massimiliano Caldarone, Bottega Artistica, 5419/B Cannaregio, in Campiello Widman. 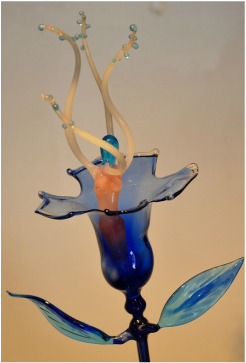 There are no limits, beyond the artist's imagination, to what can be created with Murano glass. In his small studio in Campiello Widman, artist Massimiliano Caldarone builds seemingly impossibly fluid and delicate contemporary Murano glass sculptures. More than just "beautiful", each of his pieces conveys such a strong sense of feeling and movement that they seem to be telling their stories as you observe them. Lampworking, practiced on Murano since the Renaissance, is actually among the most ancient techniques for creating intricately sculpted glass objects. Before the invention of blowtorches, a stream of air was forced through the flame of an oil lamp and thus used to heat the glass. The ability to target the flame towards small parts of a piece enabled the Murano glass masters to create ever more detailed pieces. Massimiliano Caldarone, creates his fluid sculptures using this technique for working glass. Working near the window of his small studio, Massimiliano also provides live demonstrations of Murano glass lampworking every day. 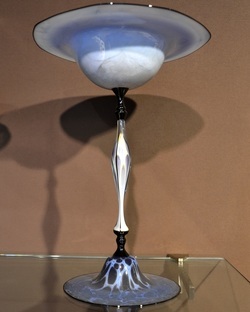 Piero Ragazzi & Co, 8 Fondamenta Venier, Murano. 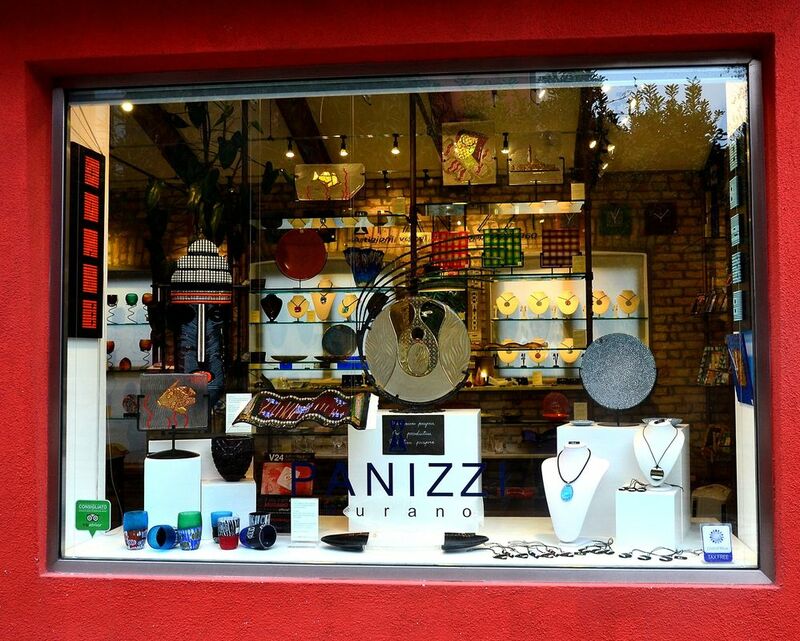 The showroom and shop of Glass Artist Piero Ragazzi. This shop offers a great selection of fun, modern and affordable glass pieces in uplifting styles and colors. Ragazzi & Co is one of the few glass houses that offers matte rather than gloss style beads and all of the pieces in the shop show a great take on the potential to fuse colors and styles in modern Murano glass. Regazzi lamp work has captured the imaginations of other Venetian artisans as well. It is not usual to find Ragazzi beads being used in as compliments to other pieces such as locally designed and produced handbags. L'Isola Glass The Carlo Moretti Showroom in Venice, San Marco 2970, Calle de le Botteghe Near Campo Santo Stefano. Carlo and Giovanni Moretti were two of the most renowned glass masters in recent history. From their combined knowledge of contemporary art and design and passion for traditional glass work they created a luxury contemporary glassware line, which is now world famous and whose pieces are on display in more than 20 museums. Though the last surviving brother, Giovanni Moretti, passed away in the spring of 2014, the Moretti factory remains one of the last surviving fully producing factories on the Island of Murano and produces pieces of unassailable quality and style. Visit the L'Isola website to learn more about this amazing company. Cesare Toffolo, 37 Fondamenta Vetrai, Murano. 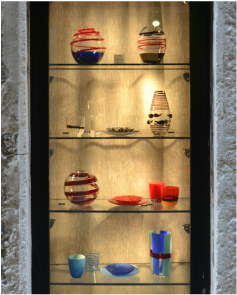 The showroom and shop of Venetian Glass Master Cesare Toffolo. Clearly the work of a glass master, the pieces in the shop range from elegant jewelry pieces though impossibly intricate stemware and stunning contemporary sculpture. This is a wonderful shop to visit to see the full range of a glass master's capabilities and range in terms of both design and execution of Murano glass. Though not inexpensive, the pieces in this shop are stunning. You can get an idea by visiting their website. Tip: While visiting this shop, be sure to ask to see the sculpture gallery upstairs. There you will find amazing large-scale glass sculptures to rival anything you can see elsewhere in Venice.